Train No.09010 Mangalore Jn. 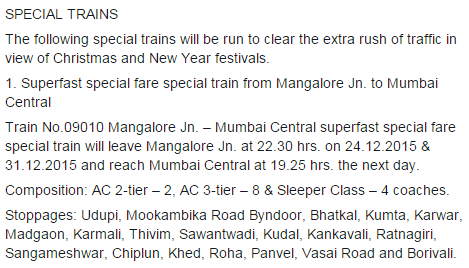 – Mumbai Central superfast special fare special train will leave Mangalore Jn. at 22.30 hrs. on 24-12-2015 & 31-12-2015 and reach Mumbai Central at 19.25 hrs. the next day. Composition: AC 2-tier – 2, AC 3-tier – 8 & Sleeper Class – 4 coaches. Advance reservations for the above trains will commence on 20-12-2015.